The Queen of Hearts is a character from "Alice's Adventures in Wonderland" by Lewis Carroll. She is a hot-tempered royal whose most famous line is "Off with their heads!" This character was inspired, of course, by the Queen of Hearts card in a deck of traditional playing cards. You could buy a ready-made outfit, but it's a cinch to do it yourself: Queen of Hearts costumes can be made in a few steps. Start this do-it-yourself Queen of Hearts costume with a red dress. Search thrift stores or discount stores for a royal-looking, formal or floor-length red dress, ideally made of taffeta, satin or other stiff material. Choose a strapless dress that you can embellish. Use a hot glue gun to make your dress look really royal by gluing some imitation stones or tiny mirrors to the bosom and hem. If you have a stud stapler, stud your dress with decorative rhinestones. Fluff up the bottom of your gown by adding some tulle to the underneath of it. Add a pair of elbow-length red gloves. Make a fan from playing cards to wear with your Queen of Hearts costume. Start by gluing three cards together fanned out. Alternate the colors, red, black and red. After you’ve glued the three together, tuck another row, this time of five cards, behind it and higher. Make sure the cards are all facing the same way. Keep the colors alternating, red, black and red. After the second row is secure, add a third and a fourth row, each with more cards than the previous row. Make the fan large enough to use but not so large you can’t hold it. The final touch is a royal collar made of cards, which will really pull this Queen of Hearts costume together. Glue cards together in a circular shape with about one-third of the circle open. This shape should fit around your neck and the edges should hang over the dress a bit. Use the alternating pattern of red-black-red-black again. Widen the collar by gluing more rows of cards to the collar. 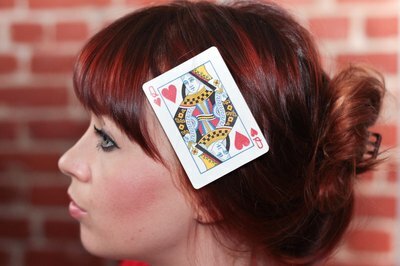 Next, use a hot glue gun to attach a Queen of Hearts playing card to a comb to wear in your hair, or glue a trio of face cards--either miniature or full size--to the hair comb. For a smaller hair ornament, cut hearts from your playing cards and glue them to your comb. Add a tiny queen's crown to your outfit and use lots of queenly attitude.